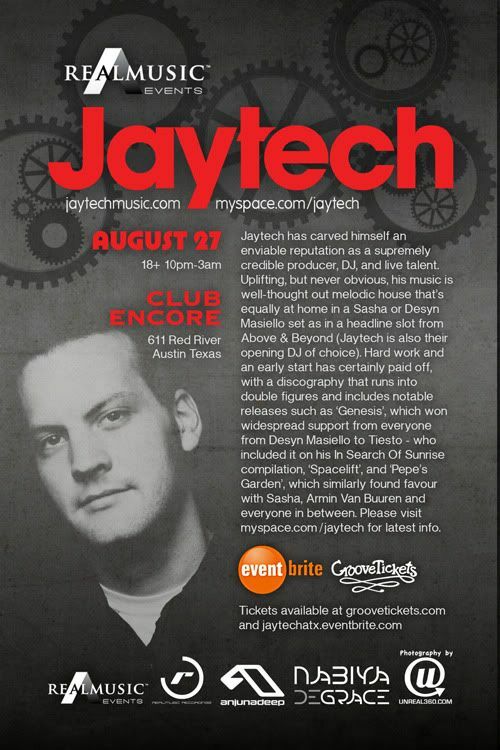 Jaytech has carved himself an enviable reputation as a supremely credible producer, DJ, and live talent. Uplifting, but never obvious, his music is well-thought out melodic house that’s equally at home in a Sasha or Desyn Masiello set as in a headline slot from Above & Beyond (Jaytech is also their opening DJ of choice). Hailing from Canberra, Australia, Jaytech had his first production signed at the age of 16 (having started producing at 14); ‘Music 101’ was a precocious start and achieved worldwide recognition. Hard work and an early start has certainly paid off, with a discography that runs into double figures and includes notable releases such as ‘Genesis’, which won widespread support from everyone from Desyn Masiello to Tiesto - who included it on his In Search Of Sunrise compilation, ‘Spacelift’, and ‘Pepe’s Garden’, which similarly found favour with Sasha, Armin Van Buuren and everyone in between. Jaytech's music is available wherever dance records are sold, including CDJShop, Beatport, DJDownload, Audiojelly, iTunes and more. Please visit myspace.com/jaytech for latest info. Ah, I wish I could go to this! But it's on the third day of the new semester.